What achievements made you choose the deck that you used? The only play achievement (other than dilemma related) that I hadn't tried yet was the high integrity achievement so that's what determined the deck. What other achievements did you consider chasing? Actually this was the only achievement I had planned on doing for this tournament. Normal solvers that didn't have Kirk or deck harassment like Maquis or Romulans, anything else I'm okay with dealing with. I didn't really have any situational cards but Bridge Officer's Test was key to winning all of my games (Reprimand helped against Justin and Ken for a runner up) There wasn't anything that I wouldn't use again. Bridge Officer's Test won me the tournament with Reprimand and ETU making the difference against Justin's Holding Cells and gun. Reprimand beat up on Ken's TT's. This year we got some new achievements in Second Edition for the first time in quite a while, thanks to the tireless efforts of Eberlems. This has been an exciting time for achievement chasers like Michael and me, and a batch that caught my eye in particular were focused around all the personnel in the deck having an attribute higher than six. There's one for Integrity (which Michael went for here), Cunning, and Strength. So far, three of the four decks that have earned the "play" version of this achievement have been TNG Earth decks (Sean's was a Bajoran deck). TNG Earth and Bajor both have access to a wide variety of high-integrity personnel, which makes them great places to start for anyone interested in earning it too. However, each of the four decks have needed to dip fairly heavily in to the Non-Aligned pool of personnel; you'd be surprised how narrow the skill pools tend to be on those personnel. 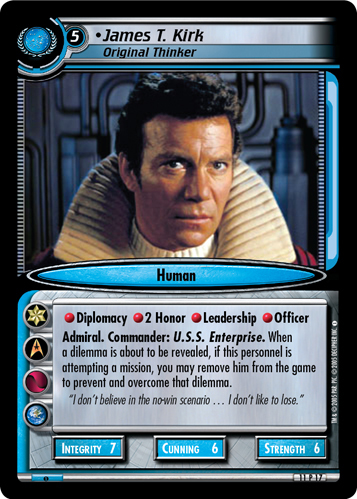 Not only does Honor take up a skill (or two) on almost every such personnel (only Jim, Hazur, and McCoy lack it in this deck), but other skills like Anthropology and Leadership tend to show up more frequently than you need them to. Perhaps it's worth considering taking an Integrity Achievement deck to a Hall of Fame format event in order to avoid Personal Duty and An Issue of Trust. 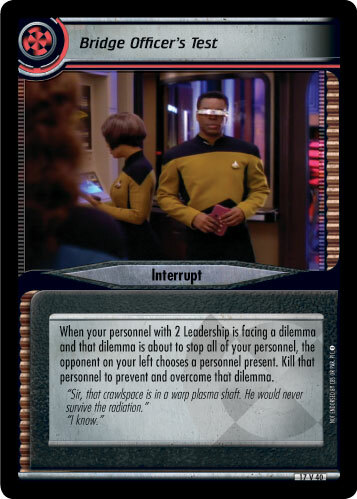 Without many natural double Leadership personnel in TNG decks (only Inyo has it here), you don't see Bridge Officer's test show up that often. However, Security Drills can always generate that second level of Leadership, and then the Bridge Officer's Test is even more of a surprise. Think about it: I usually think twice about dropping a wall like "Rapid Progress" on Klingon decks, because they invariably have a Test in hand ready to burst through it. But against a TNG deck I'm much more likely to try to block them with an Outclassed without anything to back it up. And I'd regret that against MVB. That said, if you've got robust interrupt prevention, then maybe you don't need to be to cautious with wall dilemmas against anyone. And with those three copies of Reprimand, I'd say this deck's denial ability is beyond robust. Unlike other generic prevention (like Grav-Plating Trap) you don't need to draw something with Reprimand, there are no prerequisites. You just draw Reprimand, and then the opponent doesn't play interrupts. 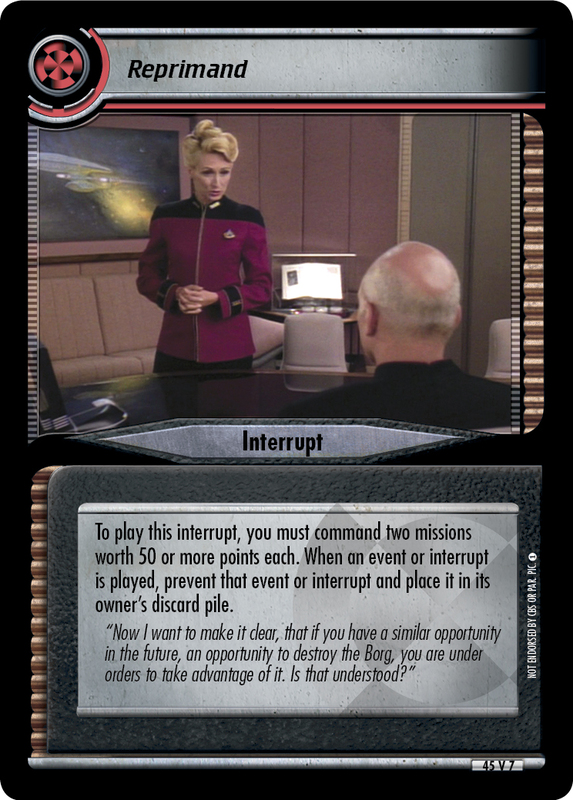 That's why I've been seeing Reprimand popping up in any deck that can afford two mission slots for 50 point missions (though those missions are rarely the ones the deck plans on solving). Why did you choose the deck that you used? What other decks did you consider using? Prior to this tournament, did you have much experience playing this deck (or decks like it)? I have played that kind of deck dozens of times, and it got a bit out of fashion. I played against the Relativity deck from Greg in an online tournament and he put three Kirks in a 40 cards draw deck. It turned out to work very well, especially with the option of getting him back next round using the Temporal Transporter. The Stakoron mission is the cherry on the Future-icon cake, very annoying to play against. MVP is the combo of Kirk and the temporal transporter + the Stakoron mission. I've seen slim Relativity decks before, but this one is as slim as it gets. The advantages are obvious - a slimmer deck draws more reliably. But has its size ever been a liability? Since the Metron Arena mission has been available for bare minimum decks, it isn't that much trouble anymore. Sure, discarding is still the main danger (Discard-Dissidents, or an early dreamer can ruin your game plan). The Tackings are the main tool for a fast refresh of your crew. Data and Janeway play for free anyway after solving the first mission. So, Sascha's been using minimally-sized Relativity solvers since 2013. That's a lot of experience with this deck type. In fact, it looks like three of his ten posted Relativity decks are variations on this ultra-slim deck, which gives an underline to the deck's title, Workhorse. With that kind of experience at the helm of a deck, you get a really good feel for its ups and downs. We've looked at other slim Relativity decks before in this series (most recently with Greg's 2018 Online Masters win), and while none of them (that I can recall) have been quite this slim, they've all shared certain qualities. First, they're very unlikely to waste many resources getting that first-turn Relativity, which can make a huge difference. I've had a plenty of people tell me they'd always rather pay four counters for Tacking Into the Wind than discard four cards for Prevent Historical Disruption, but if you don't have to do either then that's even better. This deck is as likely as it gets to do neither with three Relativities in 35 cards, and that leaves the Tackings for essential personnel recovery. Now, you may ask, why would a Relativity deck need to recover essential personnel? Don't they have access to infinite recovery via Temporal Transporters? Well, a 35 card deck can't actually recover personnel infinitely with Transporters, it just doesn't have the fodder in the draw deck. But that's part of the speed of a slim Relativity deck too - you don't need to discard two cards every turn, most of your personnel just get played for their face value, and you keep moving. Now I know I'm starting up the old argument again about the value of draws and discards - many players will factor the cost of drawing a card into its value, and will count discarding cards to pay for a card's cost as adding counters to the cost. Others will point out that draws are not exactly worth a counter, since you get seven draws for free every game (your opening hand), and other cards (like These Are the Voyages) can generate more draws than its printed cost. 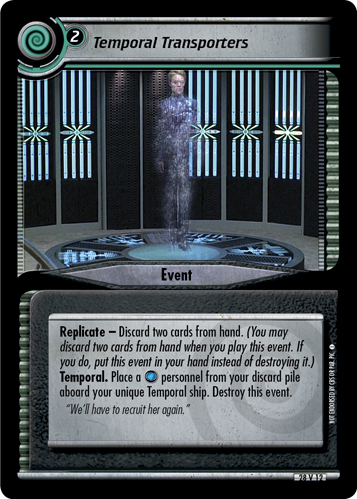 The thing is, Relativity decks are pretty light on the kinds of free draws that TATV gives you (though this deck does run a copy of it), so in Relativity draws are much closer to being worth a full counter than they would be in, say, a DS9 Common Purpose deck. So every time you pay the Replicate cost on Temporal Transporters to pull in one of those beefy four-cost personnel (like Julian Bashir, Nostalgic Doctor), you need to ask yourself how much value you're actually gaining there. Maybe you'd be better off paying retail and just paying two counters for a Temporal Transporters down the road. Next Time: An Interview with the winner of the Salem, OR Regional, and San Diego Masters winner Kris Sonsteby.